Master Dave is a Jedi, and he is kind of lazy. But who can blame the guy, he's out saving the galaxy all day, and I'm sure there's sometimes where the force is just not with you. Youtube user Warialasky has started a channel, where they make all kinds of hilarious parody videos. Like this one titled 'Rubber Band of Brothers' where rubber bands are the only weapons of mass destruction, and this one called 'A Christmas Story 2046' where a proud dad gets his sun the gift he's always wanted..a plasma gun. 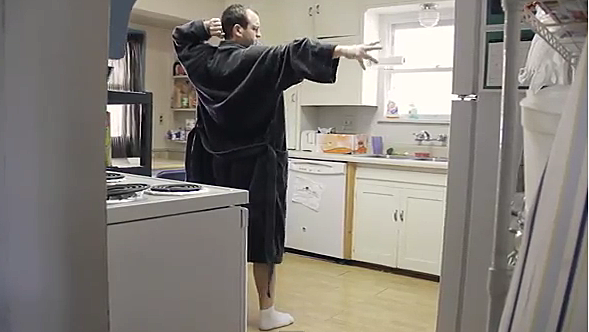 One of their most recent videos they did was 'Lazy Jedi' which depicts, what I believe would be a fairly typical jedi morning. (I mean if I was a jedi I'd shut off my phone alarm with my powers as well so I can't honestly blame the guy). Surprisingly the life of a jedi seems fairly normal, but every jedi has his day. Watch the video of the Lazy Jedi below!